I have been meaning to write this post for a while now because it brings together two of my greatest loves: eating great food and traveling to amazing places. Plus, Veneto is one of my favorite places on this beautiful earth and I definitely want to write more about our visit. So many people go to Venezia and end up coming home disappointed with their time there because of the food and crowds. My friend, Autumn had a bad experience with her meals (other than gelato), and there are so many online threads talking about how bad food in Venice is. Did you know that Venezia has a ban on wood-burning ovens in the city? There are a few restaurants that are grandfathered in, but because of this ban, it is extremely hard to find really good pizza there. – Can’t speak English? Why not choose a restaurant that has a English and Spanish and French and Dutch menus? Oooh, or even better – a picture menu!! – In Piazza San Marco? Let’s just find the most convenient restaurant here! – That pistachio gelato has to be so flavorful because it is bright green and fun. Unfortunately, all of those thoughts above are some of the many mistakes that tourists make while traveling through Italy. If you follow only one tip from this guide/tutorial, listen to this. Research, research, research. A few of my tips below also include researching, so I cannot stress enough how important it is. Before I head to a new destination, I always type things like this in Google: The best restaurants in Venice, best places to eat in Venezia, local spots to eat in Venice, etc. This usually pulls up articles, TripAdvisor, Yelp, and a few other website. I usually stick with TripAdvisor and articles/blogs. I personally love blogs the most, but to each his own. As I am going through the blogs and reviews, I write everything down. If I find a baccari (baccari is basically a bar in Venice – most people eat cicchetti and drink wine there. More on this in a minute) on a blog recommendation or travel guide, I will always cross check it on Google and/or TripAdvisor to make sure it is still open and has amazing reviews. This is how I narrow down my places since I only want the best of the best. After I narrow down my list, I will put all of the places in a Google map and a Google Doc. On my Google Doc, I will list the name, address, phone number, hours, and a sentence or two about what they offer. This way, when I am traveling, I can have everything organized in one document. There are many ways you can research, but don’t go into a new city, especially abroad, without doing some research! Like I mentioned in my Venice Travel Guide, we had an amazing tour guide named Lorenzo. He took us through Venezia and explained everything to us. He told us where to find the best eats, he explained what he would recommend us doing the next day, and he told us the best ways to get around the city. Find someone to be your Lorenzo. Everyone that we ran into while in Veneto was so nice and willing to help. They actually loved helping us with directions and guiding us to the best places. Fair warning, though – we did stay in Castello area of town, which is a local residential area, so we did not ask around in the touristy areas like The Rialto Bridge, or St. Marks Square. If you don’t want to ask locals, then at least look and listen for them. You will be able to tell a good restaurant from a so-so one based on the crowd inside. The picture below is from a quaint baccari that was recommended to us by our airbnb host. Cicchetti (or cicheti): Small dishes or savory snacks. This was my favorite way to eat while there. Sarde in saor: This is a very typical venetian dish – sweet or sour sardines. Scampi alla veneziana: Shrimp with olive oil or lemon juice. Caparossoi a scota deo: Clams with lemon and pepper. Bigoli in salsa: Noodles (similar to spaghetti) with anchovies. Bacalà mantecato: Whipped salt cod. A lot better than it sounds! Prosecco: According to Lorenzo, Prosecco is THE wine to drink in Venice. Steer clear of restaurants located in popular places, like St. Marks Square, or The Rialto Bridge. If you want to have a great view, the least you can do is find a good place around there from researching or from a local. A lot of these places cater to tourists, so they will serve bad food for really high prices (ie. number one reason Venice gets a bad foodie rap). If you take a five minute walk down the twists and turns of the walkways and canals, you will find a gem of a restaurant, I can promise you that. Whatever you do, don’t dine at a place that has different menus hung up for every language and/or a picture menu. THIS IS THE MOST OBVIOUS TOURIST TRAP. Just save yourself and avoid those places. Artisanal gelato is carefully crafted, using high-quality, local ingredients and is made slowly by hand. Bad gelato is usually whipped and uses low-quality ingredients. Finding good gelato is easy if you just follow a few tips, though, which I previously talked about in my article on how to find the best gelato in Rome, Venice, and Bologna. Check that post out and let me know what you think. It is packed with helpful information to help you steer clear of the ‘bad’ gelato. 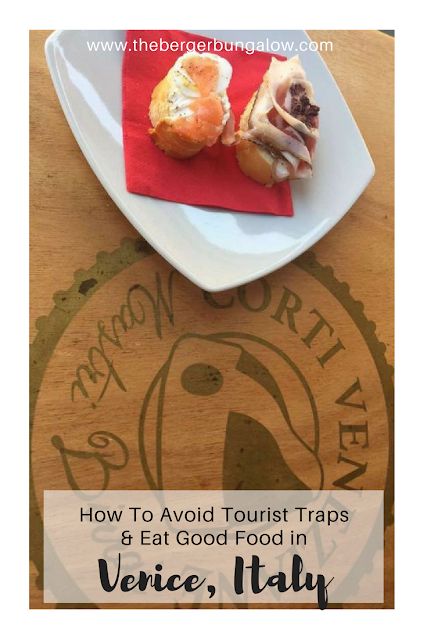 I guess this tip doesn’t really help you avoid bad tourist trap restaurants, but I wanted to include it because it is a foodie tip that I think everyone should know. Plus, here’s a fun fact: Venice is home to one of the oldest bars (aka. coffee shops) in the world. It is located beneath porticos in Piazza San Marco. Caffè Florian opened in 1720 and still whips up cappuccinos to this day, although they are very expensive. A traditional practice in all of Italy is to stand up while you ‘take’ your coffee. Most of the time, Italians drink a shot of espresso and eat a pastry for breakfast. The reason for this is because a shot of espresso is quick – you do not sip on it, you take it just as it is: a shot. So, get ready to gulp that sip back! Don’t be shy to put sugar in it, though, if you need it. A shot of espresso, standing up, should be right around €1.00, give or take some depending on the bar you are at. Of course, you can sit down, but sitting down = more money. We stood at the bar most of the time, but there is something magical about sitting down with a cappuccino and relaxing on a beautiful day. Although there are a few ‘rules’ when it comes to drinking coffee in Italy, I tended to break them. For example, cappuccinos are supposed to be a morning only drink due to indigestion. I loved breaking this rule because Italian cappuccinos are magical and I could drink them at all hours of the day. Oh, Venice. How I love you and your unique culinary adventures. I am constantly dreaming of the day that I can go back and explore more restaurants and dishes again.